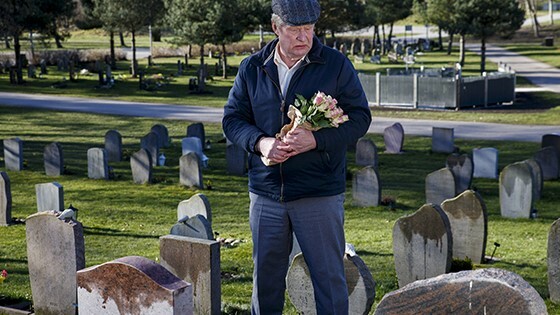 Anyone who has seen the trailer or read a synopsis of Hannes Holm’s sad and funny A Man Called Ove might be tempted to avoid it due to the high level of schmaltz found therein: a crotchety old scrooge who’s the scourge of the neighborhood discovers a new reason for living right as he’s about to give up on life. Shots of Ove doing his best Walter Matthau “Grumpy Old Men” imitation, or of children tenderly reaching out to Ove and having him respond in Grinch-like fashion certainly don’t help either, which is too bad. Beneath this sugary surface lies a subtle character portrait worthy of attention. Holm, who usually writes and directs his own films, adapted Ove from a best-selling Swedish novel of the same name- a hired gun in what was clearly a commercially driven Swedish studio project. All one needs to do is recall similar American ventures like Eat Pray Love or Fifty Shades of Grey to appreciate just what a piece of garbage Ove could have (and probably would have) been in American hands. So Holm deserves points merely for avoiding that obvious pitfall. But Ove succeeds by employing flashbacks interwoven throughout the film that reveal Ove’s backstory; they provide context to the clichéd premise with a genuine humanity that reminds you there’s a lifetime of experience hiding behind every octogenarian you run into at the supermarket. Rolf Lassgård is A Man Called Ove. Ove just might be the best use of multiple actors portraying the same character at different ages in cinema, or at least in recent memory. Child Ove, Young Man Ove, and Old Ove not only look alike, but act like different aspects of the same person along a continuum of experiences. While acclaimed Swedish actor Rolf Lassgård comically plays Old Ove as an outspoken grouch who doesn’t really care how who is offended by his bitter kvetching, it’s Young Man Ove’s Filip Berg that provides the nuance and contrast, showing us a shy, socially-awkward young man whose distrust of people has been shaped by some pretty harsh experiences. 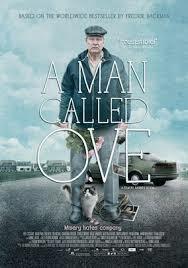 What is comically evident in Old Ove is merely nascent, yet subtly clear, in Young Man Ove. Only with his beloved, life-embracing wife Sonja (Ida Engvoll) does he feel safe enough to reveal a warmer side, and when she’s gone, so is his one emotional connection to the outside world. While none of this may seem very groundbreaking, Holm & Company’s ability to make the familiar seem fresh and poignant makes the film come together. Ove’s present-day relationship with his Iranian neighbor, Parvaneh (Bahar Pars) is also nicely played, providing a layer of social commentary about cultural relations that many Americans could benefit from watching. The film really only stumbles at the very end, when the schmaltz factor finally kicks in with a cringe-worthy ending that does a disservice to the delicate balance Holm had so nicely woven between “feel-good” and Hallmark- but it’s not enough to derail this warm, thoughtful film. Music Box’ blu-ray edition includes the usual “making of” featurette and an interesting Q&A with director and cast that provides some cultural context about the film’s commentary on modern Swedish society.